I spent last week in London doing some filming for an opera production called The Devil Inside, which in itself was very fun, but I also decided to explore as much of the city as possible while I was there! I was lucky to be staying pretty central - just across the road from Euston Station, in fact - in building of short let flats called Endsleigh Court. I've stayed there before when I worked for this opera company, Music Theatre Wales, last year, and it's absolutely perfect if you're staying in London for work. Unlike most hotels, Endsleigh Court provides each room with its own kitchen, which is handy if you don't want to be eating out all day every day! They also include an en suite, a mini dining table, a tv, and a very spacious wardrobe (YES). As I needed to work from my room (editing videos, sending emails etc) it was great to feel like I had my own fully-equipped little flat for the week. From my little base near Euston, it was only a short 20 minutes walk to Camden, which is one of my favourite parts of London. Again, I visited it briefly last year so I knew what to expect, but I don't think this is an area you could ever get bored of. 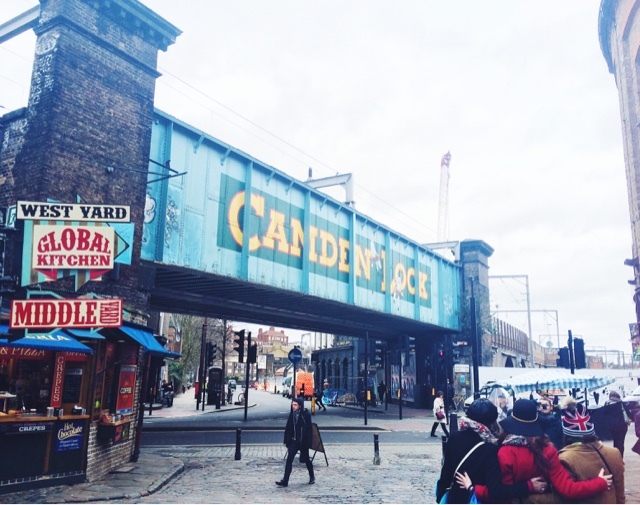 The Camden Lock Markets, in particular, are the stuff of dreams if you're a fan of street food, bargains, and eclectic fashion. They have the ability to constantly surprise you - around every corner there's something completely different! And I'm yet to spot a food stall there that doesn't look insanely delicious. My advice for visiting the markets? Get cash out first as not all the all stalls accept card, and that way you can limit yourself to spending that amount. 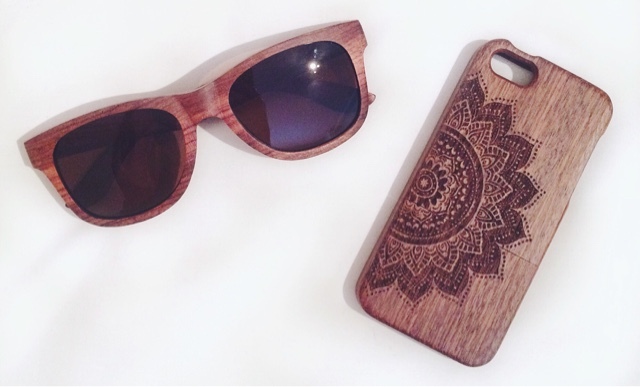 On this trip, I decided to be a total Camden hippy/hipster and buy a wooden phone case and sunglasses! 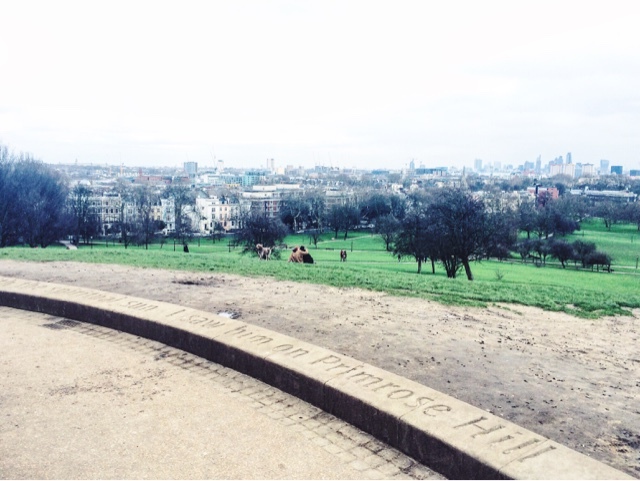 After spending more money than I'd intended in the markets (and having eaten a delicious but enormous burrito from one the stalls), I decided to wander over to Primrose Hill, which had been recommended to me because of its stunning views over London. It may have been a grey, gloomy day, but even so I wasn't disappointed! Nor was I the only one up there admiring the view; there must've been a good ten other people at the top of the hill, and that's not including the numerous runners who passed by. It's not a massive hill, but even so - they're braver than me for choosing to run up it! I can only imagine how busy Primrose Hill must get on a sunny day, but it's definitely worth a visit. The opera was being shown at the Peacock Theatre, which isn't far from Covent Garden, so after the opening night I ended up going for a few drinks with some of the crew! The first bar we found ourselves in was called Sophie's, and it's apparently a favourite haunt of casts and crews (I'm fairly certain one of the girls who was with us said the cast of Wicked was sat on the next table), as well as a steakhouse by day! That explains the fridge of meat that confused me so much on the night. I had a delicious prosecco-based cocktail there, which wasn't the cheapest but also wasn't extortionate in London terms. Next, we moved onto Be At One, which I believe is part of a chain of bars. They had a verrrryyy extensive cocktail menu (always a good thing!) and were a little cheaper. There was also a small dancefloor in there which we definitely used later on in the evening! I think the highlight of the night, though, had to be the moment when a member of our group had the rather genius idea of inventing our own cocktail (or trying to). You see, the plot of the opera centres around an imp in a bottle (it's based on The Bottle Imp by Robert Louis Stevenson), and the props/lighting team had created a really quite incredible bottle that glowed and swirled with a brilliant green light. So, our task fo the evening became recreating this bottle in cocktail form. 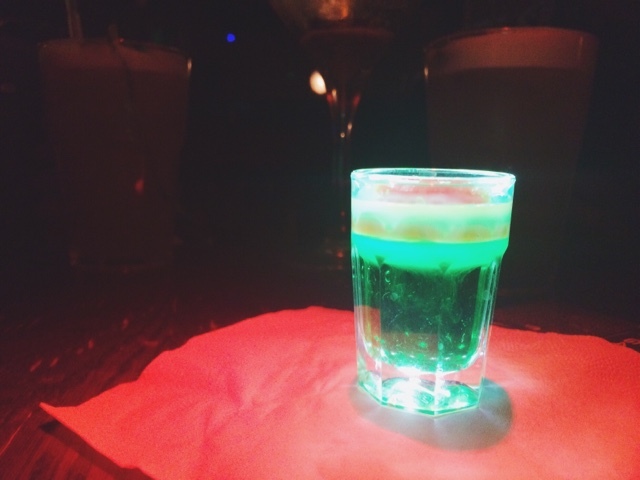 It seems the bar couldn't do this for us, but they make a shot that was a pretty damn good match - especially once the lighting designer for the show got his hands on it, and gave it an eerie glow using his phone light! I also managed to catch up with a couple of old uni friends while in the city, which was really lovely as I don't get to see them often! There are still a lot of things on my London to-do list, but all in all I'm pretty happy that I made good use of the limited free time I had there last week. If you'd like to find out more about the opera I've been working with, head over to the Facebook page for my videography! Good u shared about endsleigh court! And glad u had a good week! Sounds like you had so much fun! I love Camden Lock. It seems you had lots of fun, I want to go to London but haven't had a chance, one of these days for sure. Great post dear. Would you like to follow each other? if you decided to follow me on BLOGLOVIN and Instagram please let me know so I can follow you back. Thank you. We confirm call up to help, door to door transportation system services and relocation services with wide area network that covers almost all area in the city and provides fast and new move pack services to the punters. Nur die schönsten Kleider sind für eine perfekte Schönheit wie Sie gedacht!